Neshannock Township School District is pleased to announce that the Pennsylvania Department of Education has selected Neshannock Memorial Elementary School as a Title 1 Distinguished School for the 2018-2019 school year! NMS was selected for this honor based on English Language Arts and Mathematics PSSA proficiency meeting all four Annual Measurable Objectives. High Achievement Schools are the highest 5% of Title 1 Schools based on ELA and Math Pennsylvania Value-Added Assessment System (PVAAS). 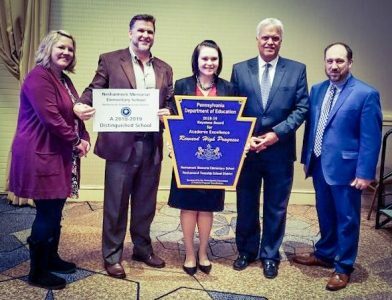 Neshannock Memorial Elementary School was recently honored at the 2019 Title 1 Improving Schools Performance Conference, held at the Sheraton Pittsburgh Hotel at Station Square, in January. District Superintendent Dr. Terence Meehan proudly attended the conference alongside Elementary Principal Mr. Matthew Heasley and Elementary Title 1 Teacher/Reading Specialist Mrs. Elyse Patrick. We are so very proud of the continuous commitment to excellence within our District. Congratulations to all involved in fostering success in our schools!